Let's play, South African style! 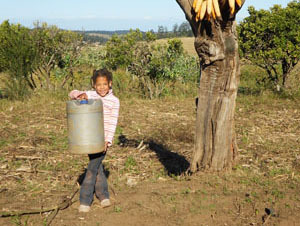 I recently went back to South Africa with my six-year-old triplets. I was looking forward to spending time with my family and the relief of not being scheduled. The rural setting that I had cursed whenever my parents took me for Christmas break is littered with mud huts set on green rolling hills but without modern amenities. While the break from technology was appealing to me as an adult, I agonized and worried over how my American children would fare. How would they adjust without TV, computers and electricity? Turns out I had nothing to worry about. My kids played in the dirt with a tennis ball fashioned out of old newspapers and plastic bags. 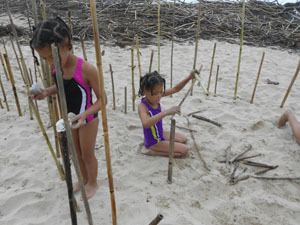 They used their creativity to turn sticks, stones and anything that they found into bats, balls, sling shots and any game they could think of. I watched as the group of friends that my shy kids amassed grew and grew until there were enough kids to play a heated game of soccer. I only saw the kids when they were hungry or when it was time for bed. As we boarded the plane and headed home for the beginning of the school year, I wondered how much play they would have in their school day. 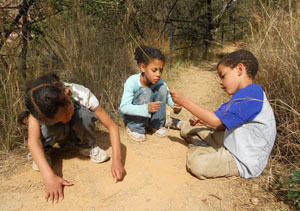 While they are at school, recess is the only time for unstructured play. Since recess is now only 15 minutes a day, I thought surely it is a must. We wouldn’t intentionally ignore the well-documented benefits to learning, social development and health, that even a 15 minute recess can provide. Realizing the significance of play, I started making it a habit to ask everyday if my children had recess. I was shocked at the answers. It turns out that sometimes the class takes too long with a lesson or other activity so recess gets cut. Or it rained three days ago and the equipment might still be wet, so recess is eliminated. Or some kids were talking at lunch so as punishment the whole class stays indoors. Added to that, my six-year-old daughter was coming home with enough homework to last an hour. How could I expect a 6-year old who had not played outside all day to sit for an hour at home doing homework? The decline in play is staggering. According to the National Center for Education kids have lost about 12 hours per week in free time since 1970 and there has been a 50% decline in unstructured outdoor play. But I didn’t need to see the statistics to know that my kids were not getting what they needed. To make what I considered an essential difference, I decided to place myself in settings where I could let kids play. I coach two soccer teams, I co-lead a girl scout troop and teach Sunday school. In all these environments I see children unable to sit still and pay attention. My reaction: let’s get up and move around! Why is it abnormal for 6-year olds to want to be active? Why is the kid who needs to stand up every ten minutes seen as odd? The biggest compliment I have yet received was when a parent who was volunteering at our girls scout meeting said, “You really just let the kids be kids.” Who would want it any other way?